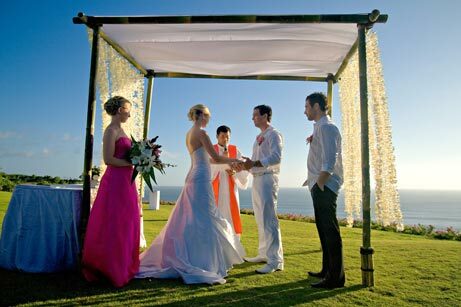 The SOCIETY OF BALI WEDDING PROFESSIONALS has at the moment two member companies that provide professional and reliable Bali wedding video services. First and foremost: BALI VIDEO PRODUCTIONS INTERNATIONAL. There, under the management of a seasoned expatriate film maker a team of professional videographers and video editors create stunning cinematographic Bali wedding videos. They use the very latest High Definition pro cameras and audio equipment and meticulously edit your video to perfection. If all you need is a 2-3 hour documentation shot with one video camera those guys are not the right ones for you. But if you want a true cinematographic documentary of the same quality like what you would see in TV then look no further. So please have a look at their website. For those on a budget we recommend the services of WEDDING PHOTOGRAPHY BALI, who also have a video department and have been creating Bali wedding videos for over 5 years. All their videos are shot and edited in full HD. They also offer small video packages for only 2 hours or even unedited video footage on disc in case you want your Bali wedding video edited back home. Pls see their videos at this link. Should you engage the services of any of the 2 companies above you can get a 10% discount by providing them a booking code from us. Please send us an email if you are interested.